Once upon a time, in a land few people today ever walk, where birds and beasts could sometimes talk, in a kingdom full of wonders, humbly lived three young brothers. One year the brothers were faced with a vexing problem - something was trampling down their fields of wheat and ruining their harvest. So they decided to take turns standing watch at night to catch the culprit. The two older brothers stood guard the first two nights, but hid in fright when storms and cold winds blew through the fields. The youngest brother, Ivan, considered the fool of the family, would have preferred to sit in a corner singing songs at the top of his voice instead of taking his turn. But once out there, Ivan stuck to his duty, and under the moonlit sky, saw what was doing the damage - a young horse with a snow-white coat. Ivan managed to jump on the animal which immediately darted every which way trying to shake its unexpected passenger off. But Ivan tenaciously stayed on, even though he was riding front-to-back and holding onto the animal's tail! Eventually the horse surrendered, but promised that if he were to be set free, he would give Ivan two golden-maned steeds of unheard-of beauty and a pony with two humps on its back and yard-long ears. Ivan could sell the two steeds, if he wished, but he should never part with the pony, who would be a true and loyal friend. Ivan agreed because he liked the idea of having the pony as a friend. (Being a fool, Ivan didn't have many friends.) Ivan then went home, but didn't tell his brothers exactly what had happened. Days later, one of the brothers wandered into the shed and discovered the two golden-maned steeds and the humpbacked pony. "So this is why my fool brother has been sleeping in here lately," he thought. He and his brothers then decided to sell the horses in town, split the profit, and not tell Ivan. "Let that fool search for them all he wants," they said. It wasn't long before Ivan discovered the two steeds missing and the humpbacked pony told him what had happened. The pony told him to jump on his back, though, and that they'd chase the brothers down. The pony was small but was as fast as lightening! In a flash, they overtook the thieves. Ivan called to them: "Shame on you, my brothers two. It might well be that you are smarter than me, but stealing horses from you is something I'd never do." The brothers apologized, but said that the family desperately needed the money. Trusting as he was, Ivan believed them, agreed to sell the horses for the family's sake, and accompanied them to town. Soon it became dark and they all decided to rest. Suddenly they noticed a strange light in the distance and Ivan was coaxed into investigating. Riding the pony toward the light, Ivan saw an entire field illuminated as if it were day! And all the light came from a bright glowing feather from the fabled firebird. The pony warned Ivan not to touch it or trouble would come his way. But Ivan picked up the feather anyway and put it under his hat. When he returned, he told his brothers that the light went out before he got there, and said nothing about the feather. The next day they all arrived in the city to sell the golden-maned steeds at the fair. The tsar got word that two magnificent animals were being sold and went to take a look at them. He fell in love with the beautiful horses and bought them at once. But as the tsar's grooms began to lead the horses off, the horses reared up, broke free from their bridles, and went back to their master, Ivan. Seeing the horses' allegiance to the boy, the tsar was compelled to ask him to work in the royal stable, an offer which Ivan accepted. But he demanded that he wouldn't be beaten and that he be allowed to sleep all wanted. Ivan did a good job in the stables, although his singing was driving everyone crazy! The royal chamberlain, whose duties as head stableman had been given to Ivan, was more than a little annoyed, though. He had it in for the young lad and watched him closely for mistakes. One day as he was spying on Ivan, he almost shrieked in horror when he saw a brilliant light coming from the room. Ivan, of course, had taken out the feather. The chamberlain reported back to the tsar that Ivan was purposely hiding the feather and that the boy bragged that he could get the firebird itself anytime he wanted. Called in before the tsar, Ivan denied everything, but became tongue-tied when the tsar opened a small chest and showed him the feather. Ivan begged for forgiveness. The tsar said that he would forgive him if Ivan brought the live firebird back to him. Otherwise the boy would be flogged and tortured to death! Poor Ivan left the palace in tears and told the humpbacked pony of his problem. The pony offered to help, saying: "The tasks here are really quite small, and I'll assist you with them all. First place in separate troughs millet and wine, then we'll get going and you'll be fine." In eight days they reached a meandering brook which stood before a majestic hill made of pure silver. The pony said that this was a favorite watering hole of the firebirds and instructed Ivan to mix the millet with the wine and put it out for the birds. Sure enough, at midnight the birds arrived and ate the concoction. When one became a little woozy, Ivan grabbed it, put it in his sack, and rode back to the tsar. When Ivan came into the palace with his catch, the bird's light was so intense that the tsar started to call for help, thinking the room was on fire! "There are no flames here," Ivan assured him. "The light is from the fabled firebird." The tsar was so amazed at what he saw that he made Ivan his personal valet. The royal chamberlain was now more incensed and jealous than ever. He swore he'd get back at the lad. Several weeks later the chamberlain heard servants in the kitchen reading a fairy tale about "a tsar-maiden, pretty and young, whose mother was the Moon, and whose brother was the Sun." The chamberlain told the tsar all about the girl and how Ivan had boasted that he could get her anytime he wanted. The tsar was so enamored with the story that he just had to have the girl for himself. So he called on Ivan to bring her in... or off with his head! Ivan once again left the palace in a horrible state. But his pony promised to help him find the maiden. The two left the palace and on the eighth day reached the ocean shore where the maiden was known to appear several times a year. Following instructions from the pony, Ivan set up a tent with dinner and sweets inside so that he could capture her when she walked in to sample the food. Sure enough, the next day the maiden arrived in her small boat and went to the tent, just as the pony had predicted. Ivan looked through a hole in the tent and thought to himself that the girl was too pale and thin for him. Then she began playing the gusli and humming a melody so sweetly that Ivan closed his eyes and fell asleep. He lost his chance that day to grab her, but succeeded the next day, and the three of them went back towards the tsar's palace. The old tsar saw the beautiful tsar-maiden and begged her to marry him. She refused. But that only made him want her more, so he kept asking. Finally, in order to end this incessant pleading, she told him that she would marry him if he would bring to her a ring lost somewhere on the bottom of the ocean. Ivan was called in once more to do this seemingly impossible task, again under threat of death if he failed. 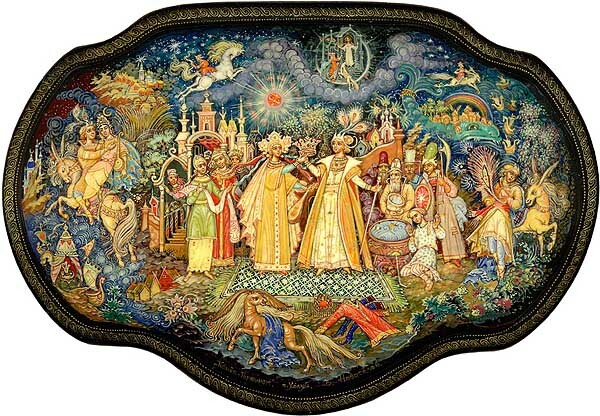 As Ivan was leaving the palace, the maiden called to him and told him to be sure to convey her greetings to her mother (the Moon) and her brother (the Sun), and to ask why they had been hiding from her for three days now. Ivan and the pony started their search for the ring at the ocean shore, where they encountered Chewdo-Youdo, a huge monster whale who had been beached there for ten years. Poor Chewdo-Youdo was barely alive. Holes and scars ravaged his body. A growth of trees had sprouted on his tail. There was even a small peasant village on his back! The huge whale looked sadly at Ivan and implored him: "If you see them soon, please ask the Sun and Moon why I am being punished so. And then I can perhaps help you find the ring, you know." So Ivan and the little humpbacked pony rode off to see the lovely Moon who lived in a crystal palace with pillars of gold. Ivan passed on the greetings from her daughter, the tsar-maiden, and asked why the Moon and Sun had been hiding their rays for three straight days. The Moon unexpectedly broke down in tears, hugging Ivan and kissing him on the cheek. "What a relief to know she's alive!" she said. "The Sun and I have been grieving under dark clouds because we thought she was lost!" Ivan told her the whole story and about the fact that the tsar wanted to marry her. The Moon was quite upset with this news because she knew the tsar was old enough to be the maiden's grandfather. "Tell her," she said, "that someday a young, handsome gentleman will come and marry her and she'll be free of the toothless tsar. Tell her also that I love her and will always be with her." Ivan ended his visit with the Moon by asking why Chewdo-Youdo was being made to suffer. She said he was being punished because he had swallowed three dozen ships. "If he lets the ships go, we will take away his woe." Ivan bade the Moon farewell and went back to Chewdo-Youdo. In his defense, the whale said he had swallowed the ships only to protect himself. But no matter - with a mighty roar, he opened his gargantuan jaws... and out sailed three dozen ships, men and all! The wounds on the whale suddenly healed and, like in the old days, Chewdo-Youdo thrashed the water with his tail, free at last. He then promised to help Ivan find the lost ring. He put the sturgeon in charge of the mission, and soon the ring was found! Arriving at the kingdom, Ivan handed it over to the tsar, who, likewise, presented it to the tsar-maiden. But she still refused to marry him. "I'm only fifteen," she said. "How could we possibly wed? All the other tsars would laugh. They'd say, 'The old fool is marrying his granddaughter!'" But she said that he could regain his youth if he dipped himself in three cauldrons: one with boiling water, a second with boiling milk, and the last with ice water. The tsar had the cauldrons prepared in his courtyard. The next day he ordered Ivan to jump in to test them. "If you don't do this for me, I'll chop you into little pieces!" Ivan, naturally, was quite frightened. But his little humpbacked pony was there and before Ivan jumped into the boiling water, the pony dipped his muzzle in each cauldron, sprayed the boy with a shake of his head, and whistled three times. Now Ivan went in. There was a hush as Ivan remained underwater in the last cauldron for what seemed like ages. Then... out he came, magically transformed into the most handsome and debonair of men! This encouraged the tsar so he threw off his own clothes, jumped in, and boiled to death in the very first cauldron. The tsar-maiden took Ivan by the hand. Ivan no longer saw her as pale and thin, but rather as the most beautiful and delicate girl ever to walk the Earth. Later the two were married with great pomp and ceremony. And they were also unanimously sworn in to lead the kingdom! Everyone lived happily ever after, including the humpbacked pony who forever remained Ivan's true and loyal friend.